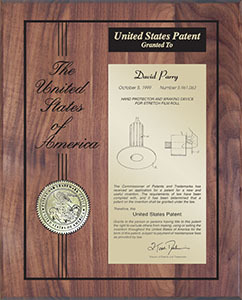 Our engraved wood patent plaques feature a standard seal page laser engraved into a walnut wood plaque. Your patent's issued patent title, patent number, description, inventors name, drawing and your company’s name and or logo can be reproduced on the presentation plate in amazing detail. The presentation plate is mounted on the highest quality solid walnut wood plaque. These engraved wood patent plaques feature a keyhole on the back of the plaque for easy wall hanging. Please keep in mind that all of our laser engraved wood patent plaques are custom-made, so if you can’t seem to find what you’re looking for please contact one of our IP Award Specialists and we will work with you to create the perfect patent plaque for you to put your awards on display.